Bob Staake's My Pet Book has been sitting on my desk for about five weeks. It makes me smile whenever I look at the boy walking his pet book. Wouldn't the cover illustration look great on a poster hanging in your classroom or your library? I think so. Bob Staake dropped by Watch. Connect. Read. to chat with me about My Pet Book, picture books, the National Book Festival, and chocolate chip cookies. Thank you, Bob! Mr. Schu: The day I received the F&G for My Pet Book was a heavy mail day. I probably received thirty uncorrected proofs that day, but My Pet Book called my name the loudest. I read it multiple times and started emailing and tweeting about it. I plan on reading it to all my classes during the first week of school. OK, I better get to my question. Why would a BOOK make a good pet? It never ate. It never drank. It couldn't do a trick. It never shed. It had no fleas. It couldn't fetch a stick. And its ears would never droop. Mr. Schu: What came first: the illustrations or the text? Bob Staake: One day I saw a boy walking a square looking dog on a leash and said to myself "that red dog is shaped like a book!" I thought the idea could be pretty funny, so I sketched a boy walking a book -- a PET book! I imagined all the fun things the boy and book could do together, so I drew up a lot of other scenes. The writing just came naturally. Mr. Schu: Did you have pets growing up? What about now? Bob Staake: We always had dogs growing up. Some of my friends had cats, but I was always afraid of them (the cats, not the friends). After college, I got my first 2 cats (Ozzie and Harriet) -- and they were the BEST. My son, Ryan, lives in Brooklyn and has a Jack Russell/chihuahua named Ziggy. I LOVE when Ziggy comes to visit me in my studio on cape Cod -- but after a week, I love seeing her go back to Brooklyn. Mr. Schu: Why do you think it is important for ALL ages to read and be read picture books? Bob Staake: I grew UP reading picture books as a child, and now I write and illustrate my OWN stories -- and I think that's pretty cool. To me, the BEST picture books are the ones that require every child reading it to discover their OWN things in the story -- and bring it to life in their own special and personal way. I am always hiding little words and little images in all of my books so that boys and girls can discover them every time they read one of my books -- again and again. 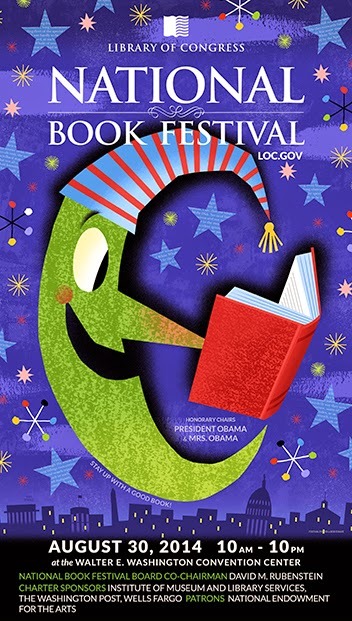 I illustrated the poster for the 2014 National Book Festival. It was very fun to do because I got to draw a city asleep, but a crescent moon happily reading a book late into the night. I'm like that moon; I love reading late at night when everyone else is snoring. Mr. Schu, you should have asked me about the incredible chocolate chip cookies. In fact, if any of Mr. Schu's students ever come to visit my studio in Cape Cod where I write and illustrate my picture books, I promise to bake them a batch! 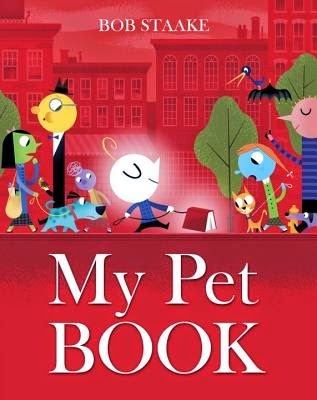 I am giving away a copy of My Pet Book. 1. It will will run from 7/10 to 11:59 p.m. on 7/11. Borrow My Pet Book from your school or public library. Whenever Possible, please support independent bookshops. This. Looks. Fabulous! Can't wait to get my hands on this book! Thanks for sharing!